New Delhi, Jan 29: Former Defence Minister George Fernandes, a committed socialist and trade unionist who went underground against the 1975-77 Emergency and fought the Congress all his life, died on Tuesday after prolonged illness. He was 88. Fernandes, who was suffering from Alzheimer's, has been out of the public eye and has been bed-ridden for more than eight years, family sources said. He had a cold and cough and was attended to at his home by a healthcare team from Max Hospital who found him dead on Tuesday morning. 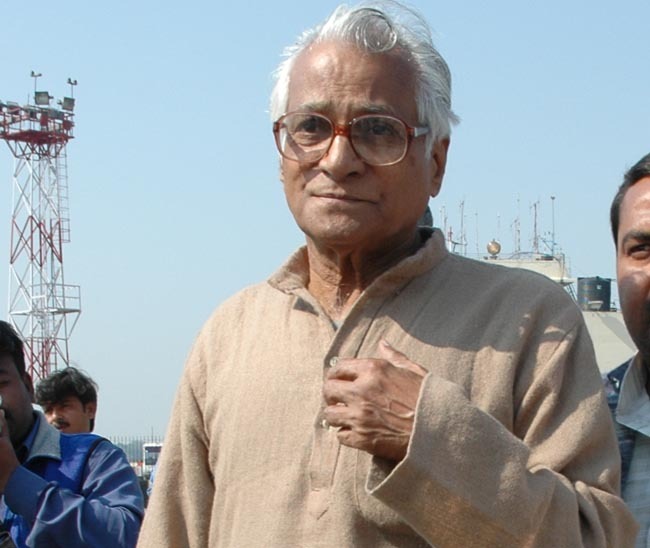 "We are saddened to announce the passing away of George Fernandes. Fernandes was attended at his home by a Max healthcare team, which found him unresponsive and declared him dead at 6.42 a.m.," a statement from Max Hospital said. Fernandes leaves behind his wife Leila and a son, who lives in New York. The son is expected back in a day or two after which the funeral will take place, the sources said. President Ram Nath Kovind, Prime Minister Narendra Modi and Congress President Rahul Gandhi led the nation in paying homage to Fernandes. Kovind said Fernandes epitomised simple living and high thinking and was a champion of democracy during the Emergency period and beyond. Modi said Fernandes resisted the Emergency tooth and nail. His simplicity and humility were noteworthy. Gandhi, whose family Fernandes opposed throughout his political career, said he was sorry to hear about his death and offered his condolences to the family and friends. Fernandes, a long-time socialist, rose to political prominence when he led the Bombay Taxi Unions Association and defeated the "uncrowned king of Bombay" S.K. Patil, a Congress heavy-weight, in the 1967 general election. A firebrand, Fernandes, only 37 then, campaigned tirelessly, covering large swathes of the constituency with his workers. And when the results were declared, he unseated the 'king' with 48.5 per cent of the votes. Fernandes later won the 1977 Lok Sabha polls from Muzaffarpur in Bihar even while in jail and became Industry Minister in the Janata Party government of Morarji Desai. He was responsible for driving out Coca-Cola from India in keeping with his socialist credentials but the drink made its re-entry later. He served as Railways Minister in the V.P. Singh government from 1989 to 1990 and was instrumental in setting up the Konkan Railway project, connecting Mangalore and Bombay. In 1994, Fernandes formed the Samata Party, which later allied with the Bharatiya Janata Party. He was appointed convenor of the National Democratic Alliance (NDA) and was the Defence Minister in the Atal Bihari Vajpayee government for two terms, between 1998 and 2004. His term was eventful as it witnessed the Kargil war and the Pokhran nuclear test. He was forced to resign on allegations of a scam in purchase of coffins during the Kargil war for bringing bodies of soldiers but returned to the Vajpayee cabinet after a clean chit from the Phukan Commission of Inquiry.